Venezuelan opposition leader Juan Guaidó has said he would consider an amnesty for President Nicolás Maduro if he cedes power. Mr Guaidó, who declared himself interim president on Wednesday, said he was reaching out to all sectors including the military to end the crisis. Mr Maduro began a second term after polls marred by an opposition boycott and vote-rigging claims. The global community is split on whether to recognise his government. But so far, Mr Maduro retains the crucial support of Venezuela’s military. The US, more than a dozen Latin American countries, Canada and the UK have backed Mr Guaidó – who is leader of Venezuela’s elected National Congress – after he said he was the legitimate president. But Russia has condemned foreign support for Mr Guaidó, saying it violates international law and is a “direct path to bloodshed”. China, Mexico and Turkey also back Mr Maduro. US Secretary of State Mike Pompeo has requested a UN Security Council meeting on the issue on Saturday. At a meeting of the Organization of American States (OAS) on Thursday, he described Mr Maduro’s government as “morally bankrupt” and “undemocratic to the core”. The Trump administration is working on a plan to funnel funds to Mr Guaidó, who is currently at an undisclosed location. UN High Commissioner for Human Rights Michelle Bachelet raised fears on Friday that the situation “may rapidly spiral out of control, with catastrophic consequences”, and called for urgent talks. 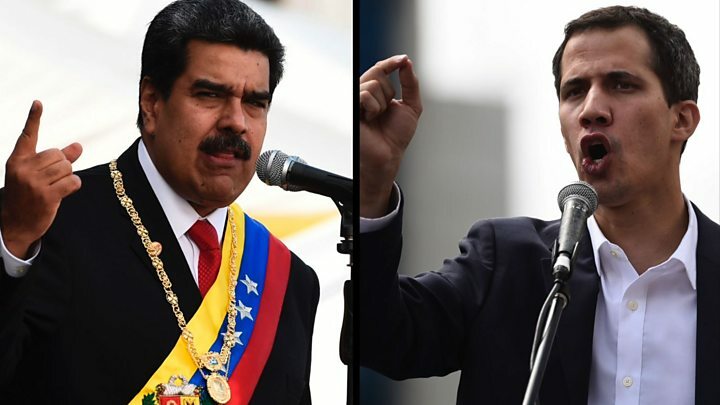 Mr Guaidó and his allies accuse Mr Maduro of usurping power through a fraudulent election. “Our challenge is to secure free elections, and we want them as soon as possible. But we are living in a dictatorship,” Mr Guaidó told US Spanish-language TV station Univision. Discussing a possible amnesty for Mr Maduro, Mr Guaidó said a similar move had played a role in Chile’s democratic transition. “These amnesties are on the table for all those who are ready to… restore the constitutional order,” he said. He has previously said articles within the country’s constitution allow him to assume power temporarily because the election was a sham. 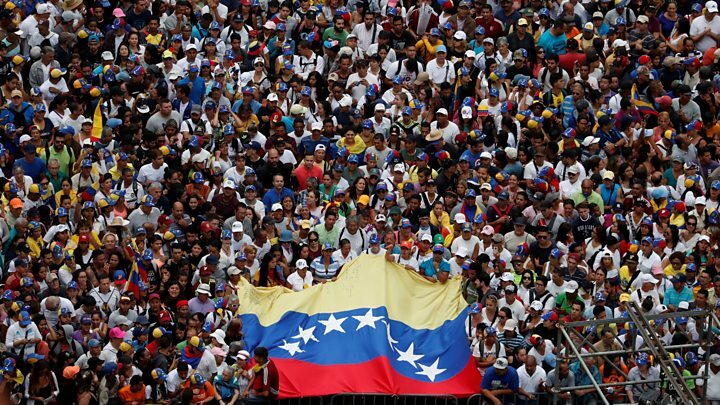 Large protests were organised against Mr Maduro on Wednesday – as well as some in support of him. At one demonstration in Caracas, Mr Guaidó declared himself the country’s acting president. Within minutes, Mr Trump recognised Mr Guaidó as Venezuela’s legitimate head of state. A number of South American nations, as well as Canada and the UK, followed suit. Mr Maduro has labelled the US comments a “big provocation” and broken off diplomatic relations. On Thursday, he ordered the closure of Venezuela’s embassy and consulates in the US. However Mr Guaidó has urged Venezuelan diplomats in the US to remain at their posts. The US state department has ordered non-essential staff to leave Venezuela. A Caracas-based NGO, the Observatory of Social Conflict, says that at least 26 people have been killed in demonstrations so far this week. What could Mr Trump do next? The US has already imposed a raft of sanctions in the past two years, which target officials in the Maduro government, restrict Venezuela’s access to US debt markets and block dealings with those involved in the country’s gold trade. But so far, the Trump administration has not taken action directly against oil imports, which are a key source of cash. A stand-off over US embassy personnel could push the White House to take that step. But analysts cautioned that oil sanctions would likely have limited effect on the Maduro regime, which could redirect shipments to allies such as China and Russia, while blaming the US for any additional hardship. Mr Maduro has led the country since 2013 and was sworn in for a second term earlier this month. His main opponents were banned from running in the presidential vote . Despite having the world’s largest proven oil reserves, Venezuela’s economy has been in a state of collapse for several years. Its industry has suffered mismanagement and oil revenue has dropped significantly. Corruption allegations have also been made. In November, a US court sentenced the former head of Venezuela’s treasury, Alejandro Andrade, to 10 years in prison for money laundering . The president has faced internal opposition and ongoing international criticism for his human rights record. Hyperinflation and shortages of food and medicine have hit the population hard, causing millions of Venezuelans to flee. Strategic partners including China and Russia have invested deeply the country’s ailing economy – ploughing billions into trade deals and loans. Moscow sees Venezuela as one of its closest allies in the region.